With the winter months just around the corner, the cooler temperatures and drop in humidity levels outside make the water in our skin evaporate more quickly, leaving it dehydrated, flaky and generally absent of that illusive summer glow we all desire. Luckily, the Gazelli Triple Youth range has the perfect pick-me-up to keep with you to banish the winter blues when out and about. This week we will look at how the balance of ingredients inside our Hydra-Radiance Face Mist instantly replenish your skin with moisture. Our most delicate product in the Triple Youth range, it delivers results in just a spritz or two. Pumpkin Extract, a natural ingredient from the traditional vegetable-growing district in the Khachmaz region of Azerbaijan, is rich in zinc, an essential mineral that boosts cell renewal, and balances and protects the skin. 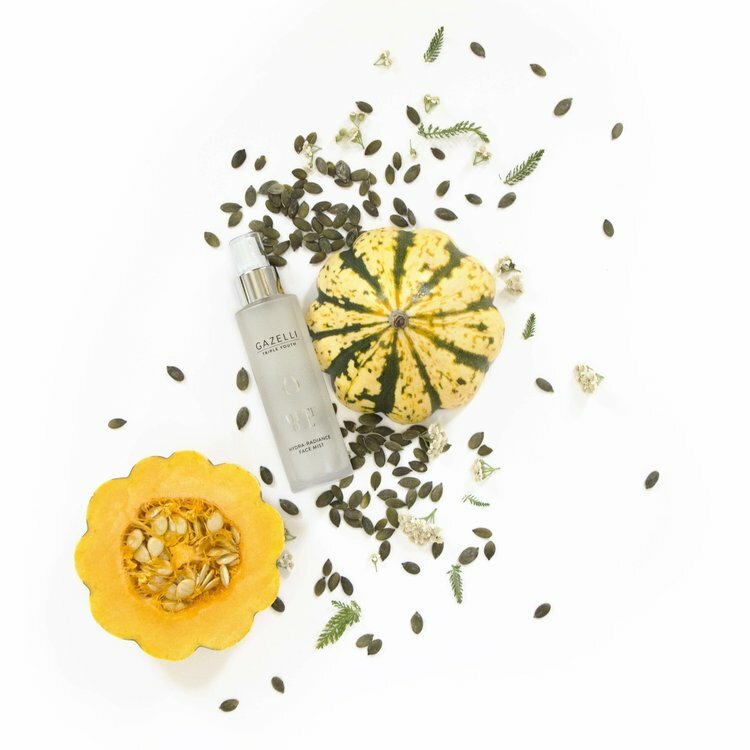 This works together with the natural-enzymes in Pumpkin that non-abrasively dissolve dry surface skin cells and promote healthier skin and reveal younger looking, glowing skin that lies underneath the surface. It also has high doses of vitamins A and C, helping to soften the skin and protect from free radicals. Ceramides reinforce the skins protective barrier. They make up about 20% of the skins intercellular matrix, they are the ‘glue’ that holds the skin cells together, helping skin maintain its appearance, while protecting it. Another natural ingredient found in our mist is Grape Seed Oil. Known for its culinary uses, but is also fanstastic when applied to this skin. The linoleic acid inside is amazing for strengthening skin cells. Its also rich in Vitamin C, which brightens skin, helping towards that glow. Last, but certainly not least, the Hydrolyzed Elastin in the mist really helps with the skins elasticity. It is a humectant, meaning it helps skin cells to attract and retain moisture, making the mist extremely hydrating. This really helps to fight the signs of aging, and prolong your natural, youthful complexion. Of course as a member of the Triple Youth Range, it contains the Gazelli White Oil™. Our powerful healing oil works to increase metabolic processes at cellular level, improving the skin’s ability to regenerate itself and absorb nutrients and oxygen. Increasing the circulation of oxygen, which will leave your skin with a natural fresh glow. Probably our most versatile product, it can be used in the AM or PM, and throughout the day, even on top of makeup, to refresh your skin, and awaken your mind with the wonderful scent. Everyone can reap the benefits from our mist, as it is suitable for all skin types, but it particularly beneficial for dry, dehydrated skin. It’s so versatile. There are so many ways you can make it work for you, use it as a body mist to highlight a tan or for a subtle aroma. Or concentrate it on feet and toes, which we are all guilty of neglecting, to treat them to a boost of moisture.